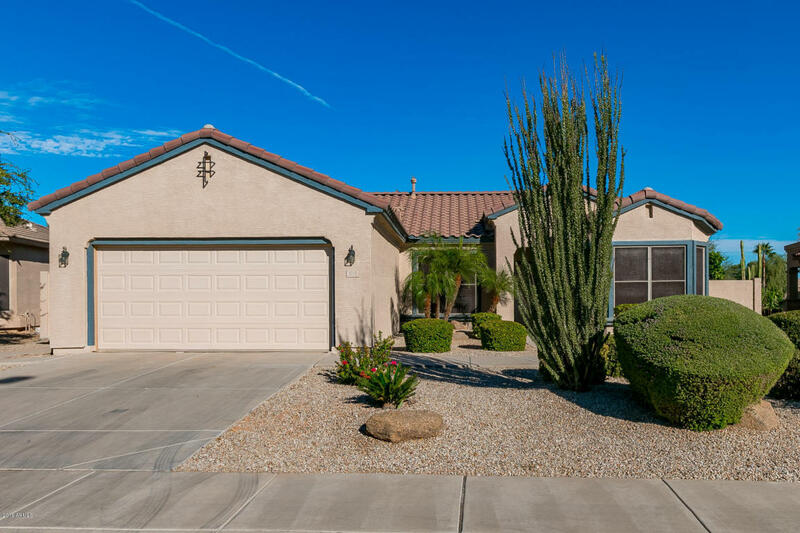 Beautiful home softly lived in and well maintained right on the Lone Tree Golf Course. Original owner carefully picked travertine tile for the entry, kitchen hall and baths, rich wood flooring for the living room and a comfortable carpet for bedrooms. Large open kitchen with granite counter tops, lots of cabinets and pantry, eat in breakfast nook and recessed lighting. Master bath has walk in shower, dual sinks and walk in closet. Windows all have sun screens and plantation shutters, providing additional cooling efficiency and and elegance on the interior. Large back patio with saltillo tile and ceiling fan, well landscaped back yard, with view fence and access to Lone Tree golf course. Community has club house, pools, spa, tennis, pickle ball, and much more!